Casillas, C. J., Enns, P. K.Wohlfarth, P. C. (2011), ‘How public opinion constrains the U.S. Supreme Court’, American Journal of Political Science, 55(1): 74–88. Cohn, J. 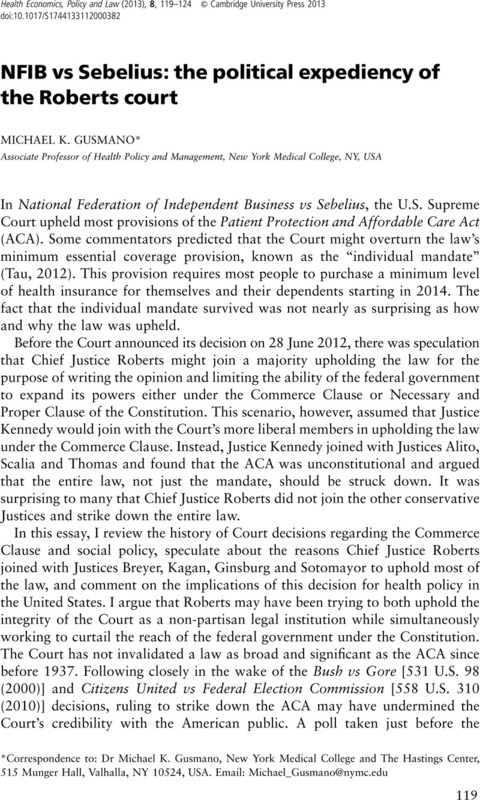 (2012), ‘Is the Court's legitimacy really at stake?’, The New Republic, April 2, http://www.tnr.com/blog/jonathan-cohn/102254/supreme-court-obamacare-legitimacy-mandate-bush-gore# [29 October 2012]. Durr, R. H., Martin, A. D.Wolbrecht, C. (2000), ‘Ideological divergence and public support for the supreme court’, American Journal of Political Science, 44(4): 768–776. Klarman, M. J. (2004), ‘Brown at 50’, University of Virginia Law School Public Law and Legal Theory Working Paper Series, Paper 5. Klein, E. (2012), ‘Unpopular Mandate: Why do politicians reverse their positions?’, The New Yorker, June 25, http://www.newyorker.com/reporting/2012/06/25/120625fa_fact_klein [25 October 2012]. Liptak, A.Kopicki, A. (2012), ‘Approval rating for justices hits just 44% in new poll’, New York Times, June 8: A1. Metzger, G. E., Morrison, T. W., Pincus, A. J. 2012. ‘Brief of Constitutional Law Scholars as Amici Curiae in Support of Petitioners’, In the Supreme Court of the United States, No. 11–398. Nicholson, S. P.Howard, R. M. (2003), ‘Framing support for the supreme court in the aftermath of Bush v. Gore’, The Journal of Politics, 65(3): 676–695. Tau, B. (2012), ‘Toobin: Health Law ‘Looks Like it's Going to be Struck Down’ ’, Politico, March 27, http://www.politico.com/politico44/2012/03/toobin-health-law-looks-like-its-going-to-be-struck-118811.html [28 October 2012).